over $8.5 million raised since 1990! $792,901 raised in 2018 – a new record. 100% of all funds raised stay in Maine, and go directly to ending hunger. Largest, non-hunger organization-based, philanthropic fundraising effort to end hunger in Maine. 285 organizations supported in 2018! Signature social responsibility campaign for Maine’s credit unions. 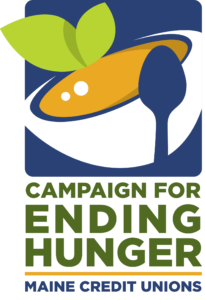 The Maine Credit Unions’ Campaign for Ending Hunger is a 501(c)(3), which means all contributions are tax-deductible! 2019 marks the 29th year of the Campaign. For more information contact Tim Brooks at 800.442.6715, ext. 298. In addition to individual credit unions contributing to food pantries and hunger organizations in the communities they serve, the Maine Credit Union League coordinates statewide initiatives to make an impact statewide. From distributing funds to raising awareness, there are a variety of ways the Campaign makes a difference. The Campaign is one of the major supporters of this program. To date, the Campaign has contributed more than $200,000 to help expand and support the backpack program and school food pantry program in schools across Maine. Since the Campaign’s involvement, these programs have grown from serving a few hundred kids per week to thousands of kids each week, and now operates in more than 125 schools statewide. Find out more about the Backpack program by clicking here. In early 2018, the Maine Credit Unions’ Campaign for Ending Hunger announced a new five-year, $100,000 commitment to the renovation of the new Good Shepherd Distribution Center in Hampden. 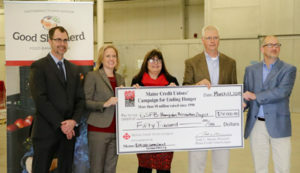 As part of the commitment, the Food Packing Area at the facility will be known as the Maine Credit Unions’ Campaign for Ending Hunger Food Packing Area. When complete, the Center will have a capacity to provide more than 10 million meals, making a significant impact to the effort to ensure all Mainers have not only enough food but access to enough food. In 2005, the Campaign partnered with Good Shepherd Food Bank to provide the initial support to bring the first Food Mobile to Maine. Since then, the Campaign makes annual contributions to continue to support this initiative that delivers food to areas in need, especially during emergencies. Learn more about the Food Mobile. Since 2002, the Campaign and Brenda Davis, one of the state’s leading ending hunger advocates, have partnered to raise awareness about the issue of hunger by creating and supporting the Annual Maine Credit Unions’ Ending Hunger Walking Tour. Each October and November, the Tour visits communities across Maine and makes a contribution to a food pantry in each community. In 2018, the Tour was the largest ever, with visits to a total of 96 credit union locations in 90 communities. Nearly $40,000 was contributed from the 2018 Tour. Dates for the 2019 Tour will be announced in the summer.